How much impact can a supervisor have on safety? After all, one person can only do so much, right? If only we had a way to actually quantify that impact...well, now we can. In fact, that is exactly what our research has been focusing on for the past few years. We have been working with companies in a lot of different industries for over 20 years, so we’ve learned a thing or two about leader behavior and how it impacts safety. And while we all would probably agree that the role of a leader is very important, until now there has not been much empirical data on how important this role really is to safety metrics such as incident rates. So rather than speculate, I’ll just share with you some of the things we’ve found so far. We have been able to show a direct link between a leader’s psychological profile and the injury rates of the team that they supervise. In other words, if we assess a leader for certain traits and competencies, we can estimate the risk of an incident for those who report to him/her. This is done using a validated psychometric test battery that measures specific characteristics that are necessary for effective safety leadership. Scores for each leader are then compared to their incident/injury rates. One of our first studies in this area was in a facility that manufactured explosives for the mining services industry. We tested a group of 43 supervisors on a web-based safety leadership assessment and then gathered safety incident data for each of their crews for the previous 5 years. Each participant supervised a crew of anywhere from 12-20 operators. When we compared leaders in the bottom third of overall test scores to those in the top third, we found that leaders with low scores had an average of nearly 16 times more incidents per year in their crews than leaders with high scores. These incidents ranged from near misses to serious injuries and fire/explosion events – things you really want to avoid when you work around explosives all day. In another recent study, we assessed over 180 foreman and supervisors who worked across 12 different power and utility sites for a global construction and maintenance provider. They were broken down into high, medium, or low groups based on their safety leadership assessment scores. We then gathered first aid and recordable injury records for the crews that were supervised by these leaders and compared those to the test scores. Sure enough, over 50% of all injuries occurred on crews who were supervised by leaders with low test scores (see Figure 1 below). By comparison, leaders with “medium” range scores had only about 35% of the injuries, while those with high scores had less than 15% of the injuries occur on their crews. 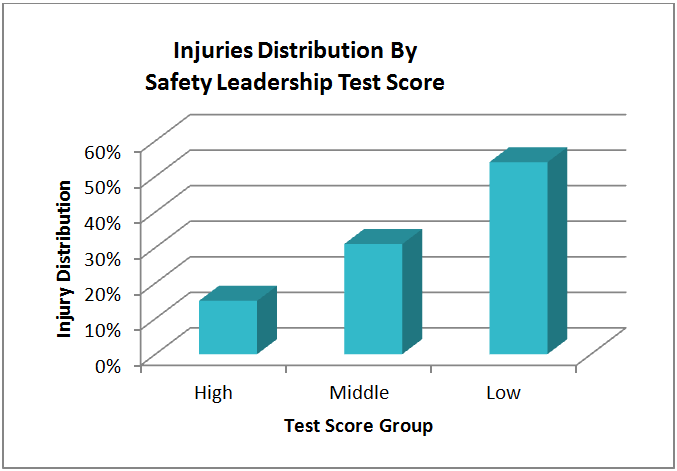 That means leaders with poor safety leadership skills had injury rates that were over 3 times higher than those with high scores. This occured despite the fact that each test score group was roughly equal in terms of size. This confirmed what we suspected - that just a small proportion of leaders in a company can have a huge, negative impact on incident and injury rates. It’s a bit like the old “80/20 Rule” where 20% percent of your people are responsible for 80% of your results (good or bad). This is the first time that research has really connected an individual leader to actual safety incident rates on their team, and the results are exciting. But if you think about it, this is just confirming what most of us have already known for a long time, and what earlier research has shown – that a leader can influence safety in dramatic ways. 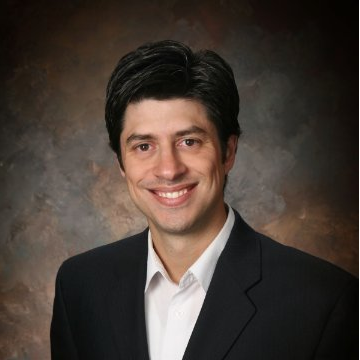 For example, studies have shown that leader characteristics and behavior have an impact on many other key safety factors such as compliance with safety policies, incident reporting, safety climate perceptions, and trust in management. So it makes sense that they would also be able to do things that will, over time, result in better safety performance on their teams. And now, we have the data to show it. But what sorts of things do good safety leaders do? What do they say? And how do they go about doing these things in a way that leads to such fewer incidents on their teams? Stay tuned over the next few weeks as we discuss these topics in detail, share what safety leadership looks like, and how you can develop your current leaders into great safety leaders.